This new release from Honest Jon's is a bipartite package. The first part contains twenty recordings of 'mostly 1920s' plucked and bowed instrumental solos recorded in various 'Middle Eastern' countries. These, like previous Honest Jon's issues in the same series, are culled from the massive archives housed in EMI's gargantuan subterranean vaults. The second part, of which more later, contains a series of improvisations by living musicians from the Anglo-American cultural nexus, putatively inspired by and reflective of the material in the first part. The package is sold either as a double CD or a 4-LP package. This disinterest in identifying the origins of the pieces in the name of pure aesthetic experience is no simple matter of respect for the listener. I have at least two major gripes here. Firstly, Honest Jon's disqualify the listener, by making the assumption that she/he is incapable of making the choice of engaging 'directly' or not, given the choice, and furthermore depriving her/him of the opportunity of perhaps satisfying their curiosity after the event of listening. Secondly, one need only to consider one's reaction if one were a Welsh music lover who had bought an ambitious Chinese- or Brazilian-produced compilation using precious and unique equivalents of the EMI archive material, recorded in the various countries of Europe, in which Albanian, Dutch, English, French, German, Greek, Irish, Italian, Lithuanian, Polish, Portuguese, Scottish, Spanish and Welsh recordings (to name but a few examples) were lumped together as 'European' and in no need of further specification. Honest Jon's can be considered to have a shouldered a humanitarian task by taking on the EMI archives, a global heritage of world-wide sound recordings extending from the beginning of the 20th century, to which access is shamefully over-guarded by the record mogul. They are discharging this task in a spirit of the chic, the cool, and then, adding insult to injury, they are depriving interested people all over the world, paying customers to boot, of the kind of information which makes further searching and/or researching possible. To give an introductory summary - the first part of the Open Strings release - as one CD or two LPs - contains 20 tracks played on stringed instruments by 13 different musicians from, in terms of geographical origins, Egypt, Persia, Syria and Turkey. The musicians have a more varied background than this might suggest: Armenian, Greek-Rom, Muslim Turkish, Syrian Orthodox, and perhaps more to be revealed.... two pairs of the musicians were probably brothers, and one invented his instrument. Their backgrounds are, at least to this reviewer, often very interesting from both historical and musical points of view. Of the twenty tracks, one can safely say that all but two (i.e. tracks 18 & 20) consist of improvisations played by musicians well-versed in the 'learned' musical traditions of their region. Their improvisations are, like those of the raga systems of classical Indian music, formed within living systems which offer implicit rules and implicit freedoms. In the countries of the former Ottoman Empire this living system was called 'maqam'. This term refers to what we call modes, ie. groups of pitches, pitch relations and typical phrases and melodic motions which, in a specific maqam, employ a limited choice of the possible pitches contained within the octave. In Persian music the corresponding general term is 'dastgah'. The two 'folk' exceptions are also the least improvisatory pieces, both being dance tunes. The word 'havasi' is Turkish for dance. When I bought the Honest Jon's Iraqi release Give Me Love I was painfully disappointed by the murderous digital mastering which had removed all traces of vitality and room acoustic from the recordings, making it, at least for me, very difficult to listen to and almost impossible to genuinely enjoy. I took the trouble to write a long letter to Honest Jon's, to which they didn't reply. I am less negative about the sound on the first CD of Open Strings than I was about Give Me Love. There isn't the desperate attempt to deny that these recordings were actually made by earlier recording processes which entail a degree of mechanical surface noise at the very best of times. I am even narcissistically tempted to wonder if they clandestinely took my letter to heart. However, as in the previous case, most of these archive discs are in such pristine condition and clearly most often pressed in acoustically favourable material, that they would hardly need any noise treatment whatsoever apart from the occasional pops, which can be removed without affecting the rest of the sound at all. But overall I have no major gripes here - one exception being the dull transfer of Tambouredji Osman Pehlivan's Anadol Kachik Havassi, which is markedly inferior to the transfer made by Jonathan Ward on his website www.excavatedshellac.wordpress.com . Jonathan has naturally had a used copy at his disposal, but has retained the upper frequencies faithfully, offering the listener the opportunity to hear the scintillating timbre of the thinly wire-strung Turkish saz which is sadly absent from the Honest Jon's transfer. There is also an inexplicable repeat - track 15, Kementchedji Alecco's Kurduli Hidjazkiar Taxim, was also included in Give Me Love. If I'm not mistaken there is confusion in track order; tracks 1 & 3, and 18 & 19 respectively, being inverted. Then there is the question of transliteration of names originally written in Arabic or Persian script. I can't claim to have any specific expertise on this matter. However, my experience while researching every one of the thirteen different artist names given on the first CD has been that Honest Jon's have made no effort whatsoever to transliterate according to current or previously employed transliterations. The result is that though several of the musicians are, or were, famous within their cultures, most of them are not traceable on the web under the names given them by Honest Jon's except on links referring to the Honest Jon's release. In order to trace information, one has to be knowledgeable, imaginative and experimental, and to have experience of the idiomatics of transliteration, for example that in Persian the name Hossein is neither pronounced nor transliterated as Hussein. For the uninformed and curious listener, the identity of both performers and instruments is thus potentially a source of considerable confusion. As to the word used for the improvised prelude in a named mode, which many of these performances are: the Arabic word for this is variously transliterated as taqassim, taqsim, taxim and taksim; the first two in Arabic contexts, the third in other non-Arabic and non-Turkish contexts, and the fourth in modern Turkish contexts, as the Kemalist version of the latin alphabet eschews the letter 'x', otherwise often used in modern transliterations of Kurdish. The word is not used in Persian music, where the terminology is more complicated; this is a matter into which I will not delve here for reasons of space and limited knowledge. There is a further confusing issue. Whether by chance or coincidence, there are only three plucked gut string recordings, one of an oud solo, two of qanun solos. The rest are either bowed metal- or gut-strung instruments - kemancheh, violin, and a mysterious instrument reminiscent of, but not identical with, the bowed tanbur known in Turkish as yaylı tanbur - or plucked metal-strung instruments - tar, tanbur, and a very rare instrument, reputedly invented by Arap Neş'et Bey, and known by the names of Neşetkâr or Şerâre. This latter curiosity is played by its inventor, in oud-style, on four cuts. It took me hours of research and correspondence to begin to get clarity on the identity of this musician and his instrument - work which I would normally expect to be done by the person reissuing the material. Three years after this review was initially published, I gained access to a catalogue of about fifteen thousand Turkish 78 rpm recordings, organised by record label and catalogue number. There I discovered that the instrument I have listed in the track list as neşetkâr was apparently identified by the name şerâre on the record labels. Eric Ederer informs me that as far as he knows there was, however, never any difference, other than name, between the neşetkâr (literally 'that which brings into being', or 'that which manifests') and the şerâre (literally 'spark'). It would furthermore seem that among the 24 entries for sides recorded by Arap Neş'et Bey in the above-mentioned catalogue, Honest Jons managed to select the only four sides recorded by Arap Neş'et Bey when playing this instrument of his own invention, all the others being identified as taxim played with oud. Which raises the question of whether track 12, played on a bowed instrument, was actually played by Arap Neş'et Bey at all, or in fact by another musician. The bowed instrument here is almost certainly not the yaylı tanbur as is has been known from the early 1950s, pioneered by Ercüment Batanay - i.e. a cümbüş body with a tanbur neck - as the cümbüş itself first appeared the same year Arap Neş'et Bey died, i.e. 1930. Tanburi Cemil Bey made a few acoustic recordings playing a bowed 'ordinary' tanbur in the second decade of the 20th century, some of which have been reissued, but it is still difficult to say with certainty which instrument is to be heard on track 12 of Open Strings, and by whom it is played. It would of course be of interest to see a scan of the record label itself. Unfortunately, as part of the intentional facelessness of the production, no such images appear in the package. So to the music itself. To avoid confusion, before embarking on further discussion I give the track sequence with names of artists and track titles as given by Honest Jon's. I have, though, myself added in brackets the name of the instrument I believe to be used on each track, and, to the best of my knowledge, the country of origin or ethnicity of the musician. Here is perhaps the right place to point out that 'country of origin' and 'ethnicity' are concepts which, though perhaps tragically self-evident today, in our post-Empire, post-WWII, post-Yugoslavia world, were not used for self-definition at the time all these artists were born and raised. 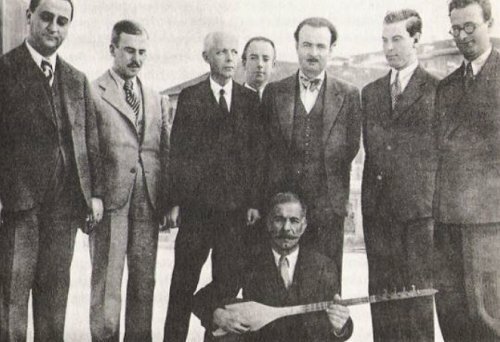 With the exception of the Persian Abdol-Hossein Khan Shahnazi (as Persians transliterate his name) and the Persian-Armenian Haigo, all these musicians were born in various parts of the Ottoman Empire at a time when the nation-state ideal was still relatively young, and when religion was both a defining parameter of belonging, and the defining parameter of the level of a person's citizen status. It is often difficult or impossible to know from a name if an Ottoman citizen was a member of the Armenian, Greek, Jewish, Muslim Turk or Rom communities. Track 1: A slip of the eye over the undotted Turkish letter 'ı' has led to the name of the musician being incorrectly spelt. He was in truth Balıkesirli Fuat Bey (c 1890-1940) renowned musician, composer and magistrate, named after his city of origin, Balıkesir, in the Marmara area. Here he gives us a fine example of a classical Ottoman tanbur taksim in makam Nikriz, a musical structure using approximately the pitches of a minor scale with a raised fourth, major sixth and minor seventh. The tanbur is a very long and narrow-necked lute with seven or eight wire strings, either four pairs, or three pairs and a single string. It has 53 or more tied frets, ideally giving the complete range of microtonal pitch possibilities used in the Turkish makam system. It is played with a plectrum. Track 2: The website www.zamanalwasl.net/forums/archive/index.php/t-725.html gives the following: '... the famous non-professional Egyptian qanun player Mustafa Bek Ridah (Mustafa Rida (1890-1952)...was also a composer, but most of all he was a prominent activist in promoting musical culture. In particular, he played an important role in the organisation of the first congress of Arab music in 1932 during which he recorded a great deal of the classical repertoire along with Darwish Al-hariri, 'aziz 'uthman, Dawud Husni and Muhammad Najib.' The name of the instrument is usually transliterated with an initial 'q' in Arabic contexts, but with a 'k' in Turkish and Greek contexts. The qanun is a plucked zither- or psaltery type of instrument with about 70 gut strings, played placed on the lap, or on a table, using fingerpicks of, for example whalebone, fastened by a ring, on both index fingers. Again we hear a taqsim, an improvisation within a given mode, or maqam. Tracks 3, 6, 8, 19: The tar player Abdol-Hossein Khan Shahnazi was the brother of Ali-Akbar Khan Shahnazi; the brothers learned from their father Agha Mirza Hosseingholi. The picture depicts Agha Mirza Hosseingholi and his young son Akbar Khan Shahnazi in 1912. The tar is one of the central instruments of Persian classical music, and variants are also played in Azerbaijan and other Central Asian countries. It is a long-necked lute with three pairs of wire strings, a figure-of-eight shaped body carved out of a single piece of mulberry wood, and a soundboard of thin, tightly stretched lambskin. It has 25 to 28 adjustable gut frets, and is played with a brass plectrum mounted in a small ball or bead of beeswax. Both Shahnazi brothers played the tar. Abdol-Hossein was the teacher of Farhang Sharif (1931-), a fine tar player who was included on both the Barenreiter-Musicaphon and the Philips-UNESCO Iran LPs. His playing on the four selections here demonstrates what sounds to me as an experimental and daring approach, in a musical culture which in the later part of the 20th century seems to have perhaps been hampered by a degree of rigid authoritarianism. The piece called Mavaraounnahr begins with an unusual use of parallel fourths, perhaps recalling the two-stringed setar, but the continuation soon reveals that it is played on a tar. Track 4: Musician not yet identified - a further example of a classical Ottoman tanbur taksim, here in makam Hidjaz, the modal form most stereotypically associated with 'oriental' music, with a minor second and major third in the lower tetrachord. Tracks 5, 9: Sami Chawa (or Sami El Shawwa) was a Greek Orthodox Syrian-born violinist whose recording career seems to have spanned about half a century from the first decade of the 20th century to the 1950s. The first of the two solos here includes a fascinating 'storm scene' with ascending and descending glissandi. Sami Chawa used various violin tunings, often somewhat lower than the modern Western standard tuning. Track 7: The kemancheh player known simply as Haigo, was among the musicians who recorded Persian music in 1939 in Beirut and Aleppo, for the Syrian SODWA label. Haigo is an unequivocally Armenian name. The Persian kamāncheh is a quite different instrument from the kemence played by Kementchedji Alecco on track 15. The kamāncheh is the spike fiddle of Iran, Armenia (k'emanch'a), Azerbaijan (also kamancha) and Georgia (kemanche). This instrument has a spherical body built of tapering wooden sections or carved in one piece; the type used in popular music may have a cone-shaped body open at the back, or be made of a spherical gourd. It is often decorated with mother-of-pearl and bone. The bridge rests on a circular sound-table which is made of animal membrane or fish-skin. The rounded neck is fixed to a spike which passes through the body and acts as a support for the instrument; the total length is usually 65 to 90 cm. Formerly the kamāncheh had three silk strings, while the modern classical instrument has four metal strings attached to wooden pegs. 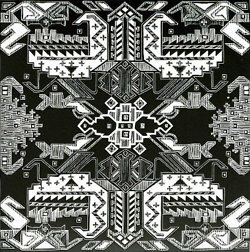 Tracks 10-13, 16: This artist was a hard nut to crack. To get from 'Nechat Bey' as given on the Honest Jon's package but nowhere else, to 'Arap Neş'et Bey' (?-1930) took me a while. This musician appears to have 'invented' the instrument on which he recorded, which was called Neşetkâr or Şerâre and which was described as having a cümbüş neck on a lafta body. The lafta is a kind of fretted Turkish lute with a wooden soundboard. However things aren't even that simple; listening to the tracks on the Honest Jon's issue one hears clearly that this is a skin or parchment soundboard, whereas the photograph of Arap Neş'et Bey included in the Kalan CD Masters of Turkish Music - Ud shows an instrument with a wooden top. Eric Ederer has worked out a convincing account of the tuning used here: from the bass upwards B E a d e a. There was in fact a fair amount of luthier experimentation going on in Istanbul in the late 1920s and early 1930s. There were at least two short-lived instruments constructed and played during this period, known as the ahenk, and the neşetkâr or şerâre. 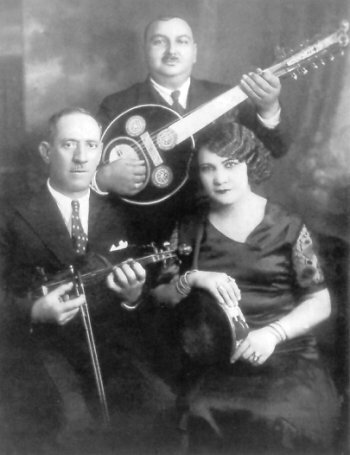 The former figures in the oft-used photograph (see below) depicting an Ottoman Greek trio of musicians: the Stromnitsa-born violinist Dimitris Semsis, the Armenian oud player Agapios Tomboulis (Hagop Tomboulian), and the Istanbul-born Jewish singer Roza Eskenazi, who years later converted to Christianity. In the photo in question Tomboulis is depicted holding an instrument which cannot be anything but an ahenk. It seems unclear whether a true neşetkâr has survived. Finally, the cümbüş was patented in 1930, the year of Neş'et Bey's death. See: www.rootsworld.com/turkey/cumbus.html The idea was to make a robust and cheap instrument which could be modified by attaching various necks to the same body, so that it could be played as an oud, or a tanbur, or various other instruments. It became an established group of instruments made by a particular family which still has a shop and workshop in Istanbul, and is the only one of these experiments to survive as more than a rare curiosity. Part of its success is due to its immediate approval by Kemal Atatürk, the founder of the modern Turkish state, who even gave it its name, which means 'fun'. All this is perhaps uninteresting to some, but given that the only hitherto reissued sides (on the above-mentioned Kalan CD) by Arap Neş'et Bey are of such inferior sound quality that it is impossible to discuss the nature of the instrument played, and that he was perhaps the only person to play, or at least record, on the instrument, one could perhaps expect more from the publisher than giving an inveterate reviewer hours of work to even get basic facts about what he's listening to. Track 14: The Ottoman-Armenian musician known as Kanuni Artaki Candan-Terziyan (1885-1948) was famous both as composer and kanun player, and can also be heard on the Traditional Crossroads CD Istanbul 1925. Track 15: Kementchedji Alecco is further a example of the confusion sown by Honest Jon's. The taxim Kurduli Hidjazkiar included here was also included on Give Me Love, though there it was only given as 'Taqsim'. However, the Give Me Love LP package was graced with a label scan of the disc side containing the taxim in question. Give Me Love was defined as Iraqi recordings. However, Kementchedji Alecco was neither Iraqi by birth or domicile. 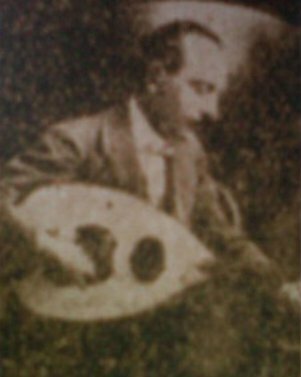 He was in fact the celebrated kemence player Aleco Bacanos (1888-1950), the brother of the oud virtuoso Udi Yorgo Bacanos represented on track 17 as 'Oudi Yorgho'. These two celebrated brothers were born into a distinguished Greek-Rom musician family in the town of Silivri, in Silivri province, nowadays a popular bathing resort area on the Sea of Marmara, and active in Istanbul/Constantinople. 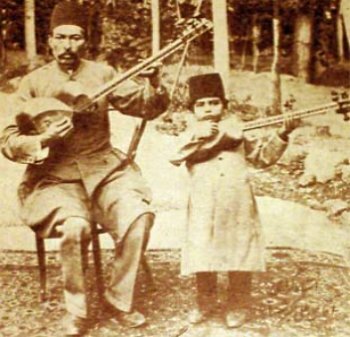 The Bacanos brothers were classic examples of the cosmopolitan/multi-ethnic character of Ottoman art music, where musical talent transcended ethnicity in determining a musician's standing and career possibilities. The brothers Bacanos (the name could well be rendered as 'Badganoss' in an idiomatic British transliteration) were in their turn related to another pair of brothers, Lambros and Paraşko Leondarides, both players of the same instrument as Aleco. Lambros, who settled in Greece, was in fact the most recorded kemence player in the Greek discography of the 1930s-50s, often accompanying such famous singers as Roza Eskenazi and Andonis Dalgas. The kemence played here is a vertically held, wooden-bodied, three-stringed bowed lyre similar to the Cretan lyra. The strings are not pressed down onto a fingerboard, but touched laterally by the surface of the left hand fingernails. It was introduced into Ottoman classical music in the latter part of the nineteenth century, possibly by an Ottoman Greek musician known as Vasilaki Efendi, also known as teacher and inspirer of the famed Tanburi Cemil Bey. Track 17: 'Oudi Yorgho' was, as explained above, the celebrated Greek-Rom oud virtuoso Yorgo Bacanos (21.09.1900 - 24.02.1977). The selection here, Seghiah taxim, is in fact the finest sounding transfer of his early work I've ever heard. The oud, or Arab lute, has a long history. It has been fretless for approximately two centuries, but was previously fretted. It has five or six courses of gut or nylon strings, all double except for one, and is played with a plectrum traditionally made from an eagle's feather. With its large carvel-built body, relatively short neck and sharply retroflected pegbox, and its often delicate decorations, it is after the Indian sitar perhaps the most familiar 'oriental' string instrument in the West today, and is the ancestor of the whole family of Western lutes which came to Europe with the Moors more than a millennium ago. A unique detail on this particular record is a clearly audible octave string pair, a phenomenon otherwise unknown on the oud, at least to this writer. In the photo we see the musician with his instrument and behind, just left of him, Bela Bartok. The saz is a generic word for a family of fretted long-necked lutes with carved wooden bodies and wooden soundboards, of varying size and stringing. All except the smallest, cura saz, have three sets of double or triple strings and are played with a plectrum. The saz has traditionally been a true 'folk' instrument played both by peasants and by the kind of wandering minstrel, often of some specific religious or mystical persuasion, known as asik. Track 20: The possibly fraternal violin duo of Mehmet and Ahmet Balki-Oglu has hitherto proved difficult to trace definitively. There was a Balcioglu (meaning son of the honey-seller) Mehmet Efe from the Aydin area - perhaps it's he and his brother or son or cousin or father? Sweetly played in a tantalising triple metre, this tune, by its name, would seem to hail from that very western Asia Minor district, once an area mainly populated by Greeks, who even managed to get an edict passed during Ottoman times restricting the settlement of Muslims in the area. The newly recorded contributions on the second CD are, to my heart and mind, a major catastrophe. It would appear that Honest Jon's have chosen a group of contemporary players of string instruments, mainly guitarists, both electric and acoustic, and asked them to listen to selected tracks and record their musical responses. An assortment of mainly Anglo-Americans has then committed the kind of travesty of plucked string musicianship which the late John Fahey, among others, laid the ground for. The common denominator is the use of combinations of 'oriental' scale forms, predominantly the scale often known as 'Hidjaz', and various plucked-string sonorities, in what are, in my opinion, self-aggrandising, more or less aimless musical meanderings, based on more or less superficial impressions of the kinds of musics represented in the archival part of the release. I could perhaps understand this being done in the 1960s, when non-Western musics were beginning to become available to Westerners on a larger scale. But almost half a century later? Give me a break! This is a striking example of anachronistic colonial ethnocentricity, and unashamed, albeit unconscious, contempt for other cultures. One might even call it an anachronistic example of 'orientalism'. I can't for the life of me fathom what was going on inside the minds of the authors of this release when they made this choice. I wonder what they actually think they achieve by juxtaposing the work of mostly classically trained musicians from the various countries of the so-called Middle East with the teenage gibberish of contemporary Western dilettantes. Perhaps the sorry truth is that they don't know any better. I must say that I feel desperate when I read the mainly positive reviews of this release from reviewers who ought to possess at least the modicum of musical knowledge necessary to be able to make at least some of the vitriolic comments I have committed in this diatribe, perhaps at slightly less lethal pH-levels. Finally - a reviewer is supposed to give their readers a hint as to whether it might be worth their while to acquire the object reviewed. As those who have managed to put up with this diatribe this far will have noticed, I am ambivalent. For those interested in hearing fairly decent transfers of mint archive copies of various Middle Eastern string players from approximately the late 1920s-early 1930s, there isn't in fact much to choose from. But the presumptive buyer has no choice but also to pay for the other half of the package, which I at least regard as unmitigated garbage. And of course the reader inspired by this review will be have the opportunity to be infinitely better informed as to what they are listening to than the buyer who hasn't read it. A further point is of course that many of these tracks are of very great potential interest and value to people outside the affluent West, from the specific cultural spheres represented. Unfortunately they are less likely to stumble over this material, as the artist names are consistently irregularly transliterated and unidentified as to origin and instrument. This in itself is an insult to the present-day members of these cultures. Some of the information on instruments is culled from The New Grove Dictionary of Music and Musicians. I have not recorded all the innumerable websites through which I was obliged to surf to arrive at some of the identifications presented. I would like to thank Eric Ederer and Jonathan Ward for their both generous and friendly participation in the research on this review. The opinions expressed are, however, naturally only my own.